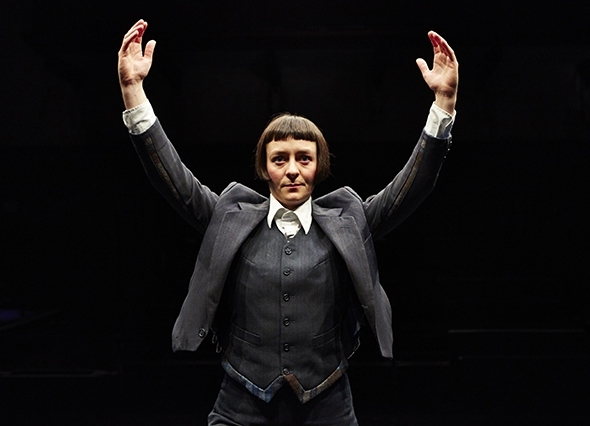 There have been three recent performances choreographed around and shot through with memory: Jane Mason’s Life Forces at The Point and Hannah Sullivan’s Echo Beach and Nic Green’s Fatherland in a double bill at The Place in collaboration with Battersea Arts Centre. All three women have woven memory around the presence of a father. In Sullivan’s case the starting point of Echo Beach is recollections of family life in which her father is the one who puts on the records; in Green’s case it is a father she met only once at the age of 16, and Mason delves into her father’s creativity through the discovery of his slide projector and archive of slides. Each work has, like memory itself, its clarity and obscurity, its fragility and solidity. All three works are memorials, acts of remembering, but each takes on a very different form. Mason builds an intimate structure with elements her father would have used — paper straws, nails, a plumb line, a projector and two portable heaters — bringing them to life as the means of remembering like a memory room based on the ancient art of mnemonics. Devised with writer Phil Smith, whose onstage role is a father figure, Life Forces is a profound meditation on the roots and influences of creativity. It is a work that builds and maintains an intriguing dialogue between past and present, between the act of creating and what has already been created. And there is an element of Alice in Wonderland as the paper straws are first strewn across the stage and later grow into small columns and you feel the construction could go on forever. Mason has a quiet intensity about her that is the life force of the work, developing it element by element with concentrated deliberation, with Smith as a touchstone, an emotional base on whose shoulders she can climb with confidence. For Green that emotional base is missing and hers is an assertive struggle to find herself in what remains. Fatherland is the most radical of the three works because of this desire to impose an impression that has already faded from memory. 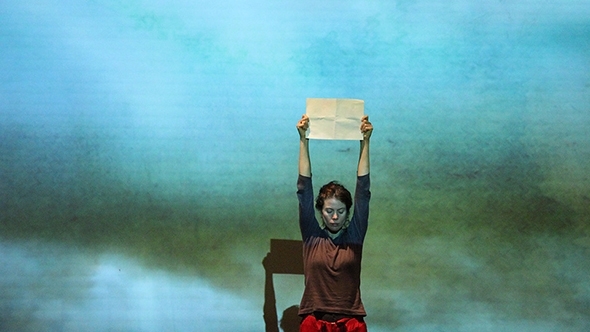 Through text, song and live music (and a tipple of malt), what she finds and celebrates in a ritualistic way is her paternal Scottish heritage — represented by the imposing onstage presence of drummer Alasdair Campbell and piper Edward Seamn — to which she bares herself as if to stamp it with her own identity. It is the uncompromising nature of this identity and the sheer force of Green’s character that gives Fatherland its stature. Dramaturg Deborah Richardson-Webb has evidently worked hard to keep Green’s expansive passion so succinctly on the stage without reducing its power. Sullivan’s memory is festooned with white pennants like a tent at a village fête; some have phrases cut into them like, ‘You Are Your Years’. One of the records her father played at home was Echo Beach by Martha and the Muffins that gives the work its name. Sullivan’s preoccupation is social dancing and she lays out what she calls her ‘dance collection’ that she has been gathering since 1999 and which she describes as ‘dancing like everyone I know.’ It is memory made up of keen observation — of seeing her parents dance in the living room, of her granddad teaching her to waltz, of friends dancing at a wedding or strangers dancing in a bar — and a lively sense of humour that transforms her collection into living snapshots. She moves and groves quietly, alternating her dances with talking about her collection and her memories. It is interesting to read that Dan Canham has provided Sullivan movement advice — not, I think, in terms of her dancing but for everything in between. There is a clarity of purpose Canham brings to his own work that keeps the fragility of Echo Beach together with minimal resources. Credit goes also to dramaturg Alice Tatton-Brown. Memory is highly personal and essentially internal. What Life Forces, Echo Beach and Fatherland have in common is they externalize memory, transforming an intimate structure into a theatrical presentation. Mason is the only one to go a step further by placing the audience on the stage, seating them in front of her with the curtains drawn behind them as if inviting them into her father’s attic or workshop at night. Of course it limits the number of people who can see Life Forces at any one time, but through this means Mason effectively draws us into her memory. Fatherland is bold enough in its imagery to withstand the spatial conventions of a full stage but Echo Beach has a dilemma: Sullivan has created it on the scale of a living room that suggests a floor lamp, a sofa and a gramophone but the stage bathes the room in too much space, too much light and replaces the imaginary gramophone with Yas Clarke’s sound design. There is nothing amiss with these production values in themselves, but with them Sullivan’s memory room tends to lose its bearings.